Zurich was recognised with the Best Life Assurance and Pensions Award at the 2016 InBusiness Recognition Awards ceremony in Dublin. Zurich picked up the Best Life Assurance and Pensions Award at the 2016 InBusiness Recognition Awards on 5th December in Dublin's Conrad Hotel. 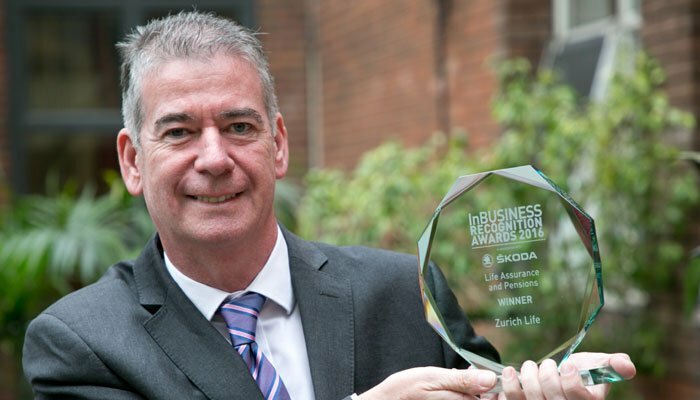 Joe Creegan, Head of Corporate Life & Pensions, picked up the award on behalf of Zurich. This is the third year in a row that Zurich has won in the Life Assurance & Pensions category, and reaffirms Zurich's position as a trusted brand in the Irish market. Now in its fifth year, the awards, hosted by Chambers Ireland's InBusiness magazine, recognise and honour exceptional business achievement and innovation in Irish business. Chambers Ireland plays an important role representing and supporting Small and Medium sized Enterprises (SME's) across Ireland and SME's are an important customer group for Zurich in Ireland. Winners of the awards were chosen across 22 categories. The Company of the Year Award was presented to Vodafone Ireland. Julie Sinnamon of Enterprise Ireland was named Businesswoman of the Year and Joe Barrett of Applegreen was named the Businessman of the Year.